Settings that don't do anything? Thread: Settings that don't do anything? All the Chinese head units I have seen are nothing more than stereos and they have no control of any of the inner workings on the CR-V like changing the way the door locks behave etc. On top of that the Stereos are pretty cheap devices. About the only good thing is that they often times have better screens and the OS is an open system that you can fully customize. As for Kenwood or Pioneer I really wish that would happen but I suspect they would need the APK files from Honda and the permission to interface with the Bus lines in order to offer the same functionality as we have with the OEM HU. While this was true previously, all the newer Chinese head units, as well as the Kenwood/Pioneer/Alpine units, have all this functionality available, though they require a myriad of adaptors that cost extra, to connect it all. Not to say that getting it all hooked up is simple or easy, but it is there now. In fact, most of the newer units have more features than anything OEM. There are loads of YouTube videos on all this, too. I apologize if this detracts from the primary topic and will shut up now. Last edited by kloker; 03-17-2019 at 08:05 AM. And many don't provide a SiriusXM tuner. Regarding the settings the OP made, be sure you are using the correct key FOB, They are labeled "Driver 1" and "Driver 2". The settings for one fob may not be in effect for the second one. Adaptors of some sort are available for some of them, but yes, not all. Can't imagine why anyone would still be falling for that scam though. I got XM when it was first rolled out, for my big truck. Had to give $100+ for the tuner, but then the subscription was dirt cheap. IIRC I paid maybe $39 for the first year. The hardware worked surprisingly well, and I got nicely hooked on certain channels, like BBC News and comedy channels, as well as a variety of music. Then the tuner went south, and I had to replace it, and it was another $130. Then the subscription rate started going up. In the end I was paying $155 per year for the subscription alone. That's when I realized it was like cable radio. Sorry, but it's not worth it. Even as a business expense. So I wised up, threw that junk in the trash, and never looked back. Also, I know the quality of their content has gone by the wayside long ago too. I cut all the "cable" and don't miss any of it. I have a cell phone and an internet connection, period. What I don't have is a large monthly nut to crack for all that drivel and dreck. I get my BBC News and World streamed free online, and listen to my 2k+ album music collection in the car. I tried Pandora for a short time too - that wasn't worth it either. I simply choose not to waste money when I have an alternative that's just as good. Nowadays, the going thing is to change everything to a service, with a subscription that seems dirt cheap, until you add it all up over a year's time. I also don't use the internet on my phone, another unnecessary expense. My data cap gives me enough to support texts and Google Maps and the weather app, that's all I need to travel. All the rest is just an extravagant waste of money. Not to mention dangerous. All this magical gimmickry in a car is unsafe, and you tempt fate every time you use it while driving. Don't become a statistic. I know too many of you will. Do you by chance have a video link to one in a CRV that shows it doing the same things the OEM HU does, especially Pioneer or Kenwood? I am very interested in doing something like that with my CRV. There's a YouTube channel called Five Star Car Stereo that has heavily technical install videos for a lot of the higher end brand name head units in all sorts of cars, including Hondas, and a couple of CR-V's as well, that, while they take a lot of time to watch all the way through, are quite educational on what is needed to precisely make all those things work. Generally, though, they show that there are ways and methods and adaptors, etc., to get it all working. Just be prepared to spend a lot of time on it. I've learned a lot from those guys. Not all the videos show all the info, you have to watch a bunch of them to get the gist of it. But it's all in there. Another one is Car Stereo Fabrication. You won't find one that has specifics on a particular head unit to a particular car. You can also find a lot of good info on the Crutchfield website, and those guys will also answer questions and help with your install if you buy from them. They can even make up plug and play harnesses for your install, and they can provide any and all adaptors or whatever that you will need. Last edited by kloker; 03-22-2019 at 02:30 AM. 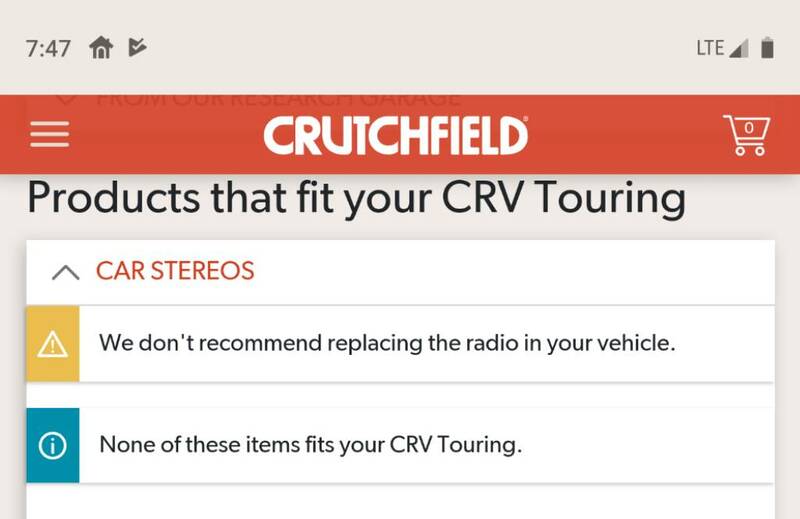 You can also find a lot of good info on the Crutchfield website, and those guys will also answer questions and help with your install if you buy from them. THey can even make up plug and play harnesses for your install, and they can provide any and all adaptors or whatever that you will need. Yes, it is really important to verify what one reads, before following advice. Unfortunately, that applies to advice often given on this forum as well. I've done pretty strong research of the AV system in the touring. The best the units can do is support steering wheel controls and "canbus" which usually means steering wheel controls or torque. The head unit needs full access to the F and B cans to fully control everything, and that's also if the right apps exist. It may need even more than that... Never seen it aftermarket, and would love for someone to show me evidence so I can get one. Well, now I see. I don't have any of these issues with my Gen3. Reminder to self: Never, ever, ever, ever buy a Gen5. Self: Thanks for the great advice! This isn't a Gen 5 problem - just about most cars in last few years even the base trims use the head unit for some level of vehicle control along with deciding what shows up in your instrument panel lcd. I think it's going to be very hard to avoid this going forward and I don't see car manufacturers having any incentive to open their systems to 3rd parties. Heck they don't even like making it easy to update their own system. 2018 EX-L vertical lumbar support doesn't do anything. Side Mirrors don't adjust with memory settings.